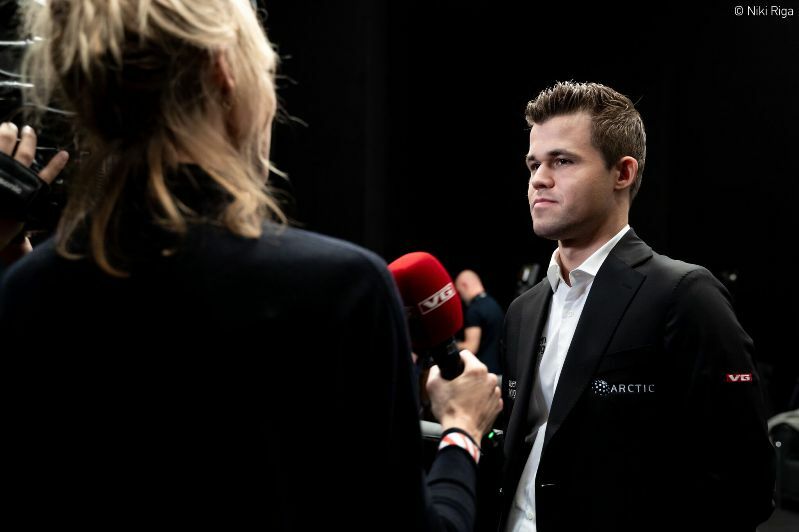 Magnus Carlsen won his 4th World Championship match in London last month, but in a blog for his sponsors Arctic Securities he admits it wasn't easy. He says Fabiano Caruana's near-miss in game 6 "changed the psychology significantly", and it was only in game 9 that he was back on track and pushing for a win. "Putting the title on the line in game 12 was never a tempting option," he notes of the controversial draw in the last classical game. Magnus confirms he's next in action in the World Rapid and Blitz Championship starting in St. Petersburg on 26 December. We haven't heard much from Magnus Carlsen since his latest title triumph, so we're lucky to have a long blog post for Arctic Securities in which he talks about some of the turning points in the match. 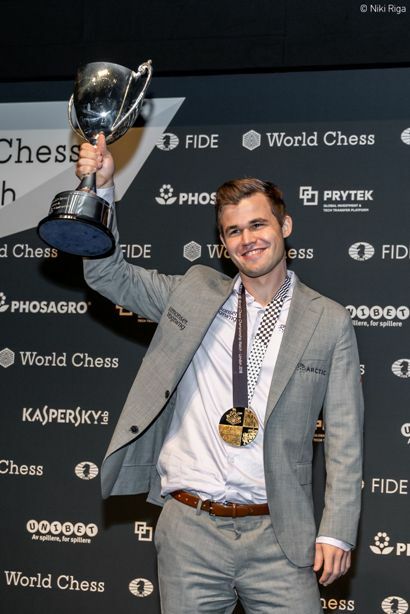 You can also see how much the title means to him, since he describes his victory over Fabiano Caruana as, "a fulfillment of personal necessity, but also an achievement of which I’m very proud". As planned I pushed quite hard as Black already in game 1, and generally throughout most of the first half of the match I remained very optimistic. His impressive play in game 6, outplaying me with Black, changed the psychology significantly, despite the boost I got from finding a far from obvious fortress to hold the game. The trend continued for a few more games. Putting the title on the line in game 12 was never a tempting option. The margin of error is smaller in a single game, and with Black, and Caruana had already shown impressive preparation in several games. To avoid this scenario, I was both very eager and optimistic about game 9 and managed to out-prepare him as planned. Not surprisingly, he took a disciplined decision with 17…Bxf3 to simplify the position. I could play for two results, but as he had a clear defensive plan I didn’t find a way to make progress except the 25.h5-challenge in his time trouble before the first time control. Caruana was up to the challenge, and combined with the subsequent 26…f5 and 27…h4 he defused the position. The opposite-colored bishop ending is not that simple, but he seemingly held it with ease. If, for instance, he had moved the h-pawn, I would have had something to target and play for. With three games to go, I prepared myself mentally for both a possibly decisive game 12 and a likely play-off. Caruana showed impressive composure throughout most of the match, while in round 12 the huge stakes involved showed in his middlegame play. White is a little better after 12.h4 h5!, but Black has lots of counterplay. His 21.Rh2-plan was interesting, but not fully sound, as long as I resist the temptation to go for a quick b5, which would only weaken my queenside and bring his pieces to life, and instead focus on getting f5 in. After that the pride of his position, the knight on e4, is pushed back, and I become active. I somewhat underestimated the strength of my position, and never saw a clear path where I could play for a win without much risk. I thought his plan Bd4 would equalize. Accordingly, I offered a draw after move 30 as planned, to reach a four game play-off. Had I seen the Nd3-threat, preventing Bd4, maybe I would have played on. He was getting low on time, and after a long think he accepted. The classical portion ended 6-6 after 12 draws, and we could prepare for the Rapid Play-Off, just as in the New York match in 2016, and also seen both in the 2006 (Kramnik - Topalov) and 2012 (Anand - Gelfand) matches. The decisive moment came already in the first rapid game. I got a both promising and interesting position from the opening with a clear plan of playing against his weak pawns on the queenside combined with emerging back-rank themes. When he played the active 19…Nb5 instead of trying to defend passively with 19…Nb7, I had two very interesting alternatives. I couldn’t make Rxd4 work, missing Kh1 next (despite looking at Kf1), and chose Bxc4 to enter a rook ending a pawn up. His counterplay (active rook, king and passed c-pawn) might be enough for a draw, but it was of course very tricky. He defended well until missing I had the intermediate check on e7 before taking on g7, after which it was a matter of technique. His play in the second game was clearly influenced by the loss of the first game, and despite an opening advantage he soon embarked on the wrong plan. I felt sufficiently confident and fresh all day and fairly quickly managed to get a winning position. In game 3, a must-win situation, he had to deviate from previous games and chose the Sicilian. I knew I was better well into the middlegame, but anyhow went for e5 to simplify the position, as I thought I had calculated far enough to see a balanced ending. He had to take risks, and after 43...Ne6? I was compelled to play for a win. Despite playing quite well, 3-0 is maybe too flattering, and the overshadowing fact was that I defended my title against such a strong opponent. Caruana matched me in the classical part, making the final victory not only a fulfillment of personal necessity, but also an achievement of which I’m very proud. I feel deep gratitude to Peter Heine Nielsen and the rest of my team of seconds. They have worked very hard and conscientiously, and once again I take this opportunity to send my heartfelt thanks. In London I had the usual team onsite, and you all contributed to the success. A special shout-out this time to chef Magnus Forssell, who prepared excellent meals for me and my team throughout the match. As usual my whole family was present for part of, or all of, the time, and it helped create the environment I needed to perform well. I would like to mention my previous trainers, most notably Torbjørn Ringdal Hansen, Simen Agdestein and Garry Kasparov, and my loyal long-term main sponsors financial firm Arctic Securities, Simonsen Vogt Wiig lawyers, newspaper VG and water supplier Isklar, as well as my own Play Magnus. I’m told the world-wide coverage of the match was impressive. Judging from the varied geographical background and number of journalists in the final press conference, the World Championship match arguably continues to be the most important event in chess. For the players the match was reasonably well-organized and special thanks goes to FIDE Supervisor A.Vardepetyan for his steady hand throughout. Many thanks also to the media and all the chess fans in Norway and abroad following the match and engaging and contributing on social media and onsite. Last, but not least, I’d like to thank Yuri Milner for hosting the great victory party (as in New York) at Rosewood hotel (where we stayed throughout the match) on the 28th! There are encouraging signs from the new FIDE leadership elected in October. I was thrilled to hear that the Rapid & Blitz World Championship will take place this year as well, between Christmas and New Year, and I’m looking forward to travelling to St. Petersburg to fight for those titles. A four-week break from tournaments is just what I need now. I look forward to following the London Chess Classic as a spectator this time. I’m planning to play regularly (approximately four tournaments) in the first half of 2019, starting with Tata Steel Chess in January. It was announced today by FIDE that the World Rapid and Blitz Championship will be taking place in St. Petersburg, Russia from December 26-30. Magnus will have a chance there to repeat his feat in 2014 of becoming the World Champion in classical, rapid and blitz chess simultaneously. 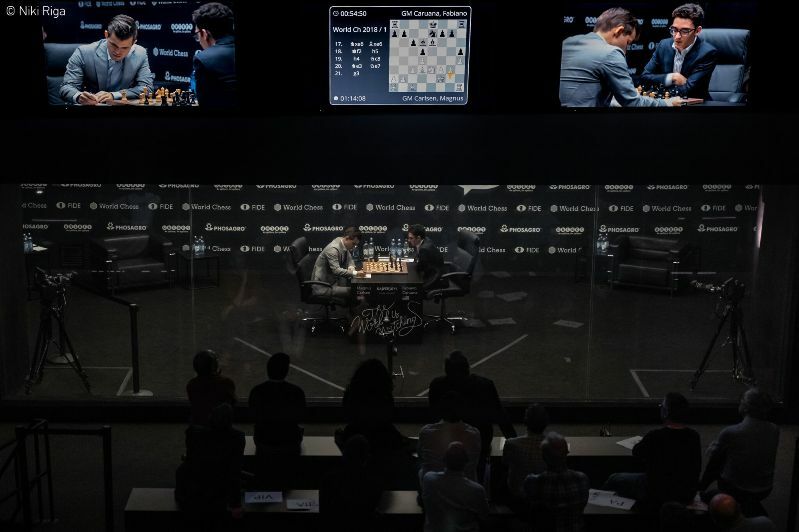 Before that we have the London Chess Classic, with Fabiano Caruana starting his Grand Chess Tour semi-final match against Hikaru Nakamura on Tuesday 11 December. You can follow all the action live here on chess24!